Oh, Pumpkin. You bring the fall spirit to life. Your scents, your taste, the warm and fuzzy feelings that brings this season to life. Ohhhh... Hey! Just a little love going on between me and my beloved Pumpkin. And really, pumpkin, the orange ooey gooey stuff, not a dreamy tall and handsome fella. 😉 (He's on my Christmas wish list!) I could go on about Pumpkin, especially because this magical orange guy is just as wonderful as the Pumpkin in the story of Cinderella! Pumpkin is so nutritiously beneficial, full of antioxidants and vitamins, but enough about that! These pancakes are easy, grain free, so naturally gluten free. But without the grains this gives you an anti-inflammatory option for those of you struggling with a little extra bloating and inflammation. 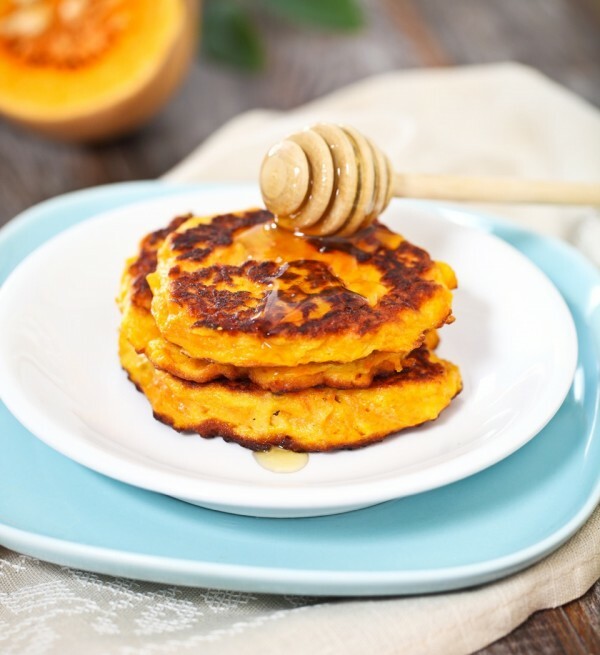 The pumpkin is a great complex carbohydrate giving you the energy you need, but not spiking your blood sugar the way refined flours and pancake mixes do. This recipe is also easy peasy, which I LOVE! This is a great fall and winter go to (but can be enjoyed all year round), and a great way to use up your left over pumpkin sitting in the back of your fridge from the baking you've been doing all season. *Recipe makes a couple small pancakes, so double recipe for more! OPTIONAL: for added protein add a 1/2 scoop of your favorite clean protein powder or use collagen powder for your protein. Flip when the whole pancake feels sturdy enough to stay together, and cook until golden brown. Enjoy with some organic Maple Syrup or raw Honey. You could also add some pecans or chocolate chips.